I was lucky enough to be invited to preview the new IMAX movie, National Parks Adventure, now playing at the Denver Museum of Nature & Science. My family loves to be outdoors, and camping is a staple of our summer plans. I knew going in I would enjoy the movie. It ignites a desire to get out and explore the 400+ parks and historic sites. 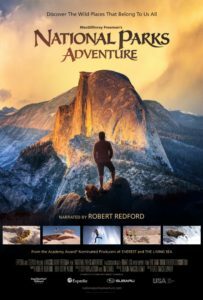 If you didn’t already know about how National Parks became a reality in the U.S., this movie will catch you up. Everyone will enjoy the beauty of the landscapes, the playful wildlife, the adventures the characters partake in, and the wonderful soundtrack. I’m excited that the coming school year sees my youngest entering 4th grade, which means we’ll be able to get a free National Parks pass. Just visit www.everykidinapark.gov after September 1st. If your 4th grader didn’t partake this year, you still have time to get a pass, but it will expire on August 31. All info is on the site. Why not take advantage of visiting a new destination? Or take your family someplace you spent time in your youth.